How's the Weather in Mexico Today? The monarch's story of survival in Mexico is one of the most amazing examples of adaptation in nature. Only 12 mountaintop forests deep in central Mexico have the unique winter habitat monarchs need. A delicate balance of climate variables—such as temperature, precipitation, wind, and sunlight—create the unique microclimate conditions that are key for survival. How do temperatures at the winter sanctuaries meet the monarchs' needs for survival? Predict: Describe the temperatures you would expect to find at the overwintering sanctuaries in Mexico. Collect Data: The nearest weather station is in the small town of Angangueo, Michoacan, Mexico. Look at today's temperature data. Record Data: Each month, record your predictions and the actual data on this chart. 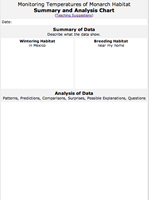 Analyze Data: Study and analyze the data on the analysis chart. 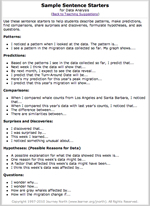 Explore the sample sentences starters for helpful prompts.